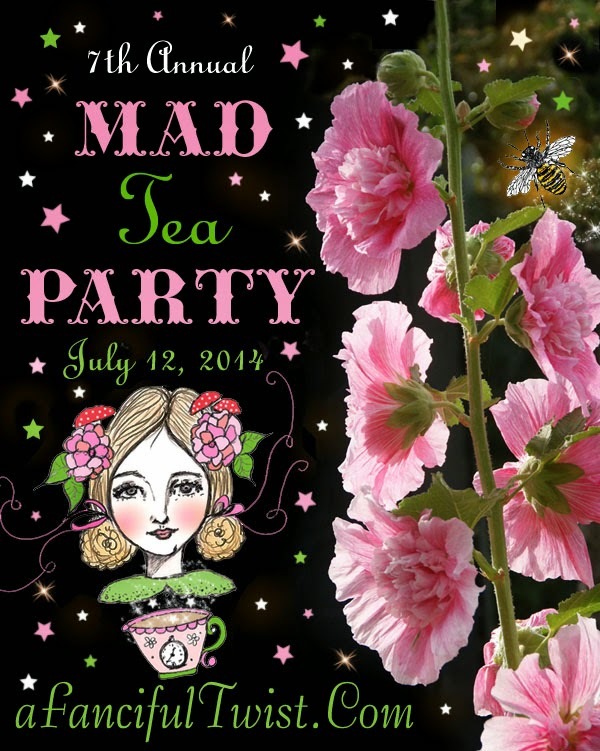 The Sketchy Reader: Mad Tea Party 2014 *plus* A Giveaway! You did an outstanding job again. I love your positive route. You are such a wonderful mother, friend, and blogger. I adore the crispness of your tablescape. White holds such elegance and simplicity, and white roses are my absolute favorites. The idea of including AIW quotes on your napkins is a fantastic idea, too. Side note, the tea book you are giving away is STUNNING! I spied it in an antique shoppe a few months ago and should've bought it at the time. It was gone last time I stopped-in to see the latest inventory. Your Mad Hatter Tea is just lovely! Love the quotes, so fun! I love, love your party! I really love the quotes and vanilla bean scones? Oh my I will be trying those very very soon! Thank you for having me to your lovely tea party, those scones look just delicious! Oh and what a generous giveaway, I have seriously wanted that book for so long! Now this was a joy. Thank you for the invite! Loved the quotes and the pictures were a treat for the eye. More tea, you ask? Don't mind if I do! I am afraid I am a bit overdue for breakfast, but fashionably late is allowed, is it not? I think perhaps a midnight tea would work for me! Your quotes remind me that we should look for inspiration in all places. the scones look delicious . . . I love the quote about the best people being "bonkers" - I agree . . . thanks for inviting me to your tea. Lovely party, thanks for the invite! Your tea party is class on a table, the linens are so elegant and those scones look simply delicious. The hand written quotes are a great finishing touch. Your room is gorgeous!!!! With the lovely sitting area and tables and beautiful tea set…I could spend all day in there! I enjoyed the visit here and as always love the quotes. What a wonderfully encouraging post...thank you! I'm also hosting a Mad Hatter Tea today so I hope you'll stop by. I'd love to do a 1920s Flapper Tea next. Maybe I will? Thanks for the opportunity to win that lovely book! I would love to host a wonderful Wonderland Tea sometime. I made a lovely banner to celebrate today but was unable to have tea. Oh Ricki, what beautiful peaceful images, and delicious treats, oh my!! Thank you for recipe and good treats, yummmmm! Thank you so much for joining in the Mad Tea magic! The party looks lovely and the scones sound divine. I must try making them. Love your party! So much fun! Thanks for much for doing a giveaway! Thanks for delightful Mad Tea Party! There were certainly some tasty goodies there. The book looks lovely - thank you for offering a giveaway. And thanks for the scone recipe - I have a nice batch of fresh currants to include - along with some delicious homemade blueberry jam! Enjoyed reading about your tea party. The give away book looks really interesting. At this time I can't think of Tea party I would have at this time. Hi RJ, I so enjoyed my visit with you at the tea party! I adore all things Alice and her adventures. Great quotes to share and fun inspiration, love the menu and the scones recipe. While in Oxford, we went into a shop devoted to Alice and her friends. I could have spent the day in that shop! I was lucky enough to get your giveaway tea book as a gift last year and it is fabulous! What a fantastic table, and I can't wait to try those scones! I've never hosted a tea party in my life (as far as I know, not even with my dolls as a child- that's what comes from being a bull in a china shop your whole life, I suppose). I think I'd like to host a mermaid-themed one. Some of those bud-teas that expand in hot water remind me of exotic coral, and I could use all aquamarine colors and pearls for decor. What a gorgeous tea party! I love all of the creamy dreamy colours, beautiful pastels and treats! I entered your lovely giveaway as I have been eyeing that book for some time! I was told to answer what type of tea party I would like to host next in the give-away box. Last year I did a Halloweeny mourning tea for my Mad Tea Party, and I think that will be my next tea party again! What a beautiful post. Thank you so much for such beauty. I would LOVE LOVE LOVE to win this book. We all need a little wonderful, right? I forgot to answer your question………I'd like to host a garden tea party when the heat of summer is past. What a lovely Mad Tea Party! I loved your choice to feature certain lines from the book. Everything looks delicious. I love that you added your recipe. I haven't been actively blogging for a while. It's nice to be back to see your page. I miss it. Here's a little thank you post. I didn't pull together my party this year. What a lovely and inspiring post. It is elegant and whimsical at the same time. I also enjoyed the recipes. Thank you for sharing. I hope you can stop by for a visit. What a lovely Tea! Thanks you for the recipe and inviting me! Fabulous!! Your celebration is delightful, my Dear...I'm so glad I stopped by! I am leaving a reply too! I left my email address for the giveaway! But I will leave it here too! Your table setting was divine! And thank you so very much for the recipes for the party. Ymmm! Ymmm! My goodness and hooray for Jam Today! What a perfect collection of quotes and I love the fact that the expression 'entirely bonkers' is as current in the UK now as it was then. 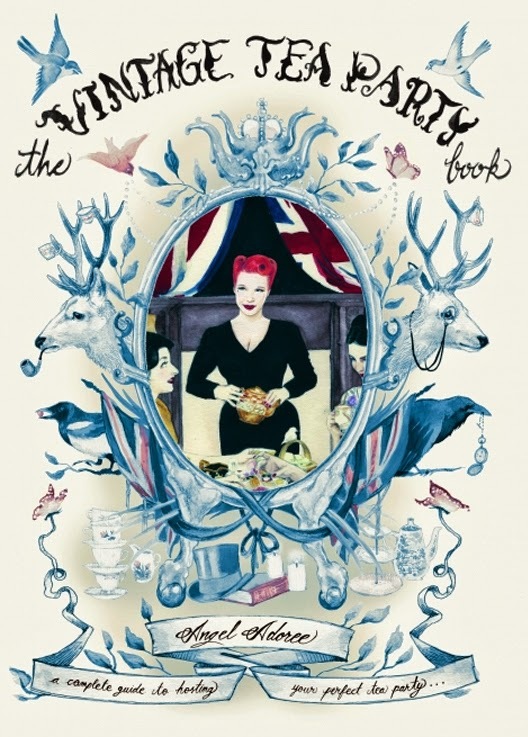 The tea party book looks scrummy! There should be more parties (and tea) Thank you for inviting me. Oh what a lovely post! I absolutely love Alice in wonderland. I´d love to host English teaparty with classic British style. It's been ages since I've visited, am so glad to see that you are still posting the lovely and amazing. I absolutely love this, and the quotes. Gorgeous, as always. After reading through your post I'd love to throw a Mad Hatter themed tea party! Bright colors with bouquets of flowers and polka dot cutlery, oh the possibilities are endless! The scones were delicious, than you for sharing! ;) I think I did something wrong with trying to leave a comment in the email box. I didn't see a place to leave a comment after I provided my info and then all the sudden . . . it said I was done! :) Ah well, I found this spot to tell you how lovely your post was! Hmmmm . . . what kind of tea party . . . well, I do hope to join in on one of them one of these days instead of just stopping by everyone else's blogs to try all the goodies . . . but, if I were going to host one and try to come up with a little different idea . . . what about a fairy garden tea party? What an elegant setting! And scones, yum! What a lovely tea party!! !